Industry has grown to recognize the value of disassembly processes across a wide range of products. Increasing legislation that may soon require mandatory recycling of many post-consumed goods and a desire to develop more environmentally benign end-of-life processes has fueled research into this concept. Traditionally, disassembly has been viewed as the reverse of assembly; however, a novel view considers just the opposite, leading to a more optimized disassembly process. 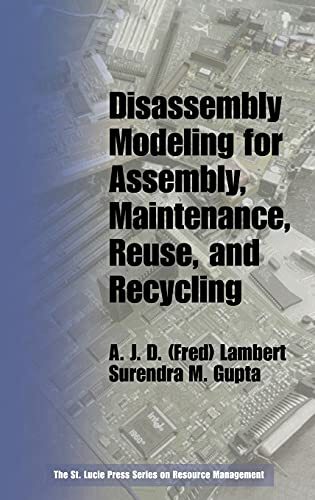 Disassembly Modeling for Assembly, Maintenance, Reuse, and Recycling presents this approach in the context of the entire product life cycle. The book examines disassembly on the intermediate level, incorporating design for disassembly, concurrent design, and reverse logistics. In this first text to supply a comprehensive discussion of the theories and methodologies associated with this approach, the authors incorporate real world case examples to explore the three main areas of application of the theory: assembly optimization, maintenance and repair, and end-of-life processing. This is a timely resource for companies that wish to enact environmentally conscious systems efficiently. With an analysis of associated costs, system design requirements, advantages, and expected results, this is also an indispensable tool for researchers, mechanical and industrial engineers, and professionals involved in concurrent design.